The second visit is usually later the same day or the following day and typically lasts 30-45 minutes. Separating the first and second visit allows your doctor any extra needed time to study your case. It also shortens the length of your first visit and allows you to obtain and remember all the information you can. After your doctor has studied your history, exam findings, and any x-rays, he or she will give you a report on all those findings and explain what those may indicate in your case. 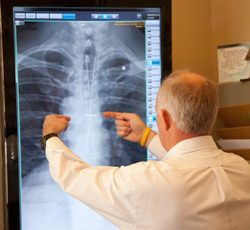 If you have x-rays or a thermal scan, they will show those to you and explain them. Spouses or other concerned individuals are welcome and encouraged to accompany you at your report. A treatment plan will be outlined and recommended to meet your goals for maximum healing benefit. Please feel free to ask any questions you may have. We are here to serve you. The more you understand about your condition and treatment the better you will heal. You may receive treatment once you have all your questions answered and feel comfortable doing so. You will meet with our patient accounts department representative. If you have insurance they will be contacted and an estimated outline of benefits will be obtained. We will be happy to complete and file your insurance claim for you. In other words, the financial aspect of your treatment will be addressed. Whatever your situation, we will do our best to come up with a plan that will work for all of us. If you don’t have insurance, or have a high deductible, we have another option that may help you. The federal government mandates the way we are allowed to charge and bill. We are legally allowed to give discounts through a program called ChiroHealthUSA (we call it CHUSA for short). CHUSA is not a health insurance, but rather a discount medical plan. It is a contracted network that allows doctors to set and accept discounts on their services for CHUSA members, who pay approximately $39.00 for an entire family, per year to join CHUSA and are eligible for time-of service discounts at our office. We are participating providers with CHUSA because we believe in helping the uninsured and under-insured in our society. Payment is expected at the time of service when your visit is finished. Keeping your account current allows us to keep our costs low, feed our own families and pay our own bills.